Grover Glenn Norquist (born October 19, 1956) is an American political advocate who is founder and president of Americans for Tax Reform, an organization that opposes all tax increases. A Republican, he is the primary promoter of the "Taxpayer Protection Pledge", a pledge signed by lawmakers who agree to oppose increases in marginal income tax rates for individuals and businesses, as well as net reductions or eliminations of deductions and credits without a matching reduced tax rate. Prior to the November 2012 election, the pledge was signed by 95% of all Republican members of Congress and all but one of the candidates running for the 2012 Republican presidential nomination. Grover Norquist in September 2011. Norquist grew up in Weston, Massachusetts. He is the son of Carol (née Lutz) and Warren Elliott Norquist (a vice president of Polaroid Corporation), and is of Swedish ancestry. His brother, David Norquist has served in senior posts in Republican administrations at both the United States Department of Defense and the United States Department of Homeland Security. Norquist became involved with politics at an early age when he volunteered for the 1968 Nixon campaign, assisting with get out the vote efforts. He graduated from Weston High School and enrolled at Harvard University in 1974, where he earned his A.B. and M.B.A. degrees. At college, Norquist was an editor at the Harvard Crimson and helped to publish the libertarian-leaning Harvard Chronicle. He was a member of the Hasty Pudding Theatricals. Norquist has said: "When I became 21, I decided that nobody learned anything about politics after the age of 21." He attended the Leadership Institute in Arlington, Virginia, an organization that teaches conservative Americans how to influence public policy through activism and leadership. Early in his career, Norquist was executive director of both the National Taxpayers Union and the national College Republicans, holding both positions until 1983. He served as Economist and Chief Speechwriter at the U.S. Chamber of Commerce from 1983 to 1984. Norquist is best known for founding Americans for Tax Reform (ATR) in 1985, which he says was done at the request of then-President Ronald Reagan. Referring to Norquist's activities as head of ATR, Steve Kroft, in a 60 Minutes episode that aired on November 20, 2011, claimed that "Norquist has been responsible, more than anyone else, for rewriting the dogma of the Republican Party." The primary policy goal of Americans for Tax Reform is to reduce government revenues as a percentage of the GDP. ATR states that it "opposes all tax increases as a matter of principle." Americans for Tax Reform has supported Taxpayer Bill of Rights (TABOR) legislation and transparency initiatives, while opposing cap-and-trade legislation and efforts to regulate health care. In 1993, Norquist launched his Wednesday Meeting series at ATR headquarters, initially to help fight President Clinton's healthcare plan. The meeting eventually became one of the most significant institutions in American conservative political organizing. The meetings have been called "a must-attend event for Republican operatives fortunate enough to get an invitation", and "the Grand Central station of the conservative movement." Medvetz (2006) argues that the meetings have been significant in "establishing relations of ... exchange" among conservative subgroups and "sustaining a moral community of conservative activists." As a nonprofit organization, Americans for Tax Reform is not required to disclose the identity of its contributors. Critics, such as Sen. Alan Simpson, have asked Norquist to disclose his contributors; he has declined but has said that ATR is financed by direct mail and other grassroots fundraising efforts. According to CBS News, "a significant portion appears to come from wealthy individuals, foundations and corporate interests." Prior to the November 2012 election, 238 of 242 House Republicans and 41 out of 47 Senate Republicans had signed ATR's "Taxpayer Protection Pledge", in which the pledger promises to "oppose any and all efforts to increase the marginal income tax rate for individuals and business; and to oppose any net reduction or elimination of deductions and credits, unless matched dollar for dollar by further reducing tax rates." The November 6, 2012 elections resulted in a decline in the number of Taxpayer Protection Pledge signatories in both the upper and lower houses of the 113th Congress: from 41 to 39 in the Senate, and from 238 to "fewer than ... 218" in the House of Representatives. According to journalist Alex Seitz-Wald, losses in the election by Norquist supporters and the "fiscal cliff" have emboldened and made more vocal critics of Norquist. In November 2011, Senate Majority leader Harry Reid (D-NV) blamed Norquist's influence for the Joint Select Committee on Deficit Reduction's lack of progress, claiming that Congressional Republicans "are being led like puppets by Grover Norquist. They're giving speeches that we should compromise on our deficit, but never do they compromise on Grover Norquist. He is their leader." Since Norquist's pledge binds signatories to opposing deficit reduction agreements that include any element of increased tax revenue, some Republican deficit hawks now retired from office have stated that Norquist has become an obstacle to deficit reduction. Former Republican Senator Alan Simpson (R-WY), co-chairman of the National Commission on Fiscal Responsibility and Reform, has been particularly critical, describing Norquist's position as "[n]o taxes, under any situation, even if your country goes to hell." Norquist speaking at FreedomFest 2013 in Las Vegas. Norquist was listed as one of the five primary leaders of the post-Goldwater conservative movement by Nina Easton in her 2000 book, Gang of Five. Working with eventual Speaker Newt Gingrich, Norquist was one of the co-authors of the 1994 Contract with America, and helped to rally grassroots efforts, which Norquist later chronicled in his book Rock the House. Norquist also served as a campaign staff member on the 1988, 1992 and 1996 Republican Platform Committees. Norquist was instrumental in securing early support for the presidential campaign of then-Texas Governor George W. Bush, acting as his unofficial liaison to the conservative movement. He campaigned for Bush in both 2000 and 2004. After Bush's first election, Norquist was a key figure involved in crafting Bush's tax cuts. John Fund of the Wall Street Journal dubbed Norquist "the Grand Central Station" of conservatism and told The Nation: "It's not disputable" that Norquist was the key to the Bush campaign's surprising level of support from movement conservatives in 2000. He has long been active in building bridges between various ethnic and religious minorities and the free-market community through his involvement with Acton Institute, Christian Coalition and Toward Tradition. He has also "announced his plan to assemble a center-right coalition to discuss pulling out of Afghanistan to save hundreds of billions of dollars." Norquist is active in Tea Party politics. Talking at a Florida rally he said "tea party groups should serve as the 'exoskeleton' that protects newly elected Republicans" from pressures to increase government spending. Comprehensive immigration reform is an interest of Norquist's, who believes that the United States should have "dramatically higher levels of immigration" than it currently does. According to a 2011 memoir by former lobbyist Jack Abramoff, Norquist was one of Abramoff's first major Republican party contacts. Norquist and Americans for Tax Reform were also mentioned in Senate testimony relating to the Jack Abramoff Indian lobbying scandal which resulted in a 2006 guilty plea by Abramoff to three criminal felony counts of defrauding of American Indian tribes and corrupting public officials. Records released by the Senate Indian Affairs Committee allege that ATR served as a "conduit" for funds that flowed from Abramoff's clients to surreptitiously finance grass-roots lobbying campaigns. Norquist has denied that he did anything wrong, and has not been charged with any crime. Norquist speaking with the Goldwater Institute in Phoenix, Arizona. Norquist's national strategy has included recruiting state and local politicians to support ATR's stance on taxes. Norquist has helped to set up regular meetings for conservatives in many states. These meetings are modeled after his Wednesday meetings in Washington, with the goal of creating a nationwide network of conservative activists that he can call upon to support conservative causes, such as tax cuts and deregulation. There are now meetings in 48 states. In 2004, Norquist helped California Governor Arnold Schwarzenegger with his plan to privatize the CalPERS system. In Virginia's 2005 Republican primaries, Norquist encouraged the defeat of a number of legislators who voted for higher taxes. Norquist is in favor of granting U.S. statehood to the Commonwealth of Puerto Rico. His position on the island's political status followed the results of a 2012 referendum that showed support among the island's citizens for obtaining state status. Norquist serves on the boards of directors of numerous organizations including the National Rifle Association, the American Conservative Union, the Hispanic Leadership Fund, the Indian-American Republican Caucus, and ParentalRights.org, an organization that wishes to add a Parental Rights Amendment to the United States Constitution. In 2010, Norquist joined the advisory board of GOProud, a political organization representing lesbian, gay, bisexual, and transgender conservatives and their allies, for which he was criticized by the Family Research Council. Norquist also sits on a six-person advisory panel that nominates Time magazine's Person of the Year. In business, Norquist was a co-founder of the Merritt Group, later renamed Janus-Merritt Strategies. I'm not in favor of abolishing the government. I just want to shrink it down to the size where we can drown it in the bathtub." Journalist William Greider quotes him saying his goal is to bring America back to what it was "up until Teddy Roosevelt, when the socialists took over. The income tax, the death tax, regulation, all that." When asked by journalist Steven Kroft about the goal of chopping government "in half and then shrink it again to where we were at the turn of the [20th] century" before Social Security and Medicare, Norquist replied, "We functioned in this country with government at eight percent of GDP for a long time and quite well." Some smaller government advocates argue that Norquist's "obsession with tax revenue" is actually counterproductive with respect to minimizing the size of government, however. Although the Americans for Tax Reform mission statement is "The government's power to control one's life derives from its power to tax. We believe that power should be minimized", critics at the Cato Institute have argued that "holding the line on taxes constrains only one of the four tools (taxes, tax deductions, spending without taxation, and regulation) used by government to alter economic outcomes." Norquist published Leave Us Alone: Getting the Government's Hands Off Our Money, Our Guns, Our Lives, in 2008. In 2012, he published Debacle: Obama's War on Jobs and Growth and What We Can Do Now to Regain Our Future, with John R. Lott, Jr. He has served as a monthly "Politics" columnist and contributing editor to The American Spectator. Norquist has also called for reductions in defense spending as one way to reduce the size of government. He favors reduced defense spending through budget sequestration. Norquist has endorsed a non-interventionist foreign policy and cuts to the US military budget. Norquist has described himself as a "boring white bread Methodist." In 2004, at age 48, he married a Palestinian Muslim named Samah Alrayyes, a Kuwaiti PR specialist who was formerly a director of the Islamic Free Market Institute and specialist at the Bureau of Legislative and Public Affairs at United States Agency for International Development (USAID). The couple has adopted two children, both girls, one of whom was adopted from the city of Bethlehem. According to friend and former roommate John Fund, Norquist's devotion to his political causes is "monk-like" and comparable to that of Ralph Nader. Norquist has competed three times in the comedy fundraiser "Washington's Funniest Celebrity" and placed second in 2009. Humorist P. J. O'Rourke has described Norquist as "Tom Paine crossed with Lee Atwater plus just a soupçon of Madame Defarge". Norquist and his wife attended the annual Burning Man festival in August 2014 in Black Rock, Nevada. Norquist explained that he wishes to attend because, "There's no government that organizes this. That's what happens when nobody tells you what to do. You just figure it out. So Burning Man is a refutation of the argument that the state has a place in nature." ^ David Skolnick (November 18, 2012). "Anti-tax pledge author: Romney failed to connect". The Vindicator. Retrieved March 22, 2013. ^ a b "ACU: Board of Directors". The American Conservative Union. Retrieved November 27, 2011. ^ "Grover Norquist From HarperCollins Publishers". HarperCollins Publishers. Retrieved November 7, 2009. ^ "Who is Grover Norquist?". Americans for Tax Reform. Retrieved November 8, 2012. ^ Howard Fineman (August 21, 2011). "It's Grover Time: Huntsman Rejects No-Tax Pledge, Pawlenty Waivers". The Huffington Post. Retrieved November 8, 2012. ^ "Grover Norquist". NNDB. 2011. Retrieved November 25, 2011. ^ Scherer, Michael (January 2004). "The Soul of the New Machine". Mother Jones. Retrieved November 7, 2009. ^ Moynihan, Michael (September 20, 2006). "Sweden's Politics of Perssonal Destruction". Reason.com. Retrieved 2012-09-05. ^ Løkke, Eirik (September 10, 2008). "Fingrene fra pengene, våpnene og livene våre". Dagbladet (in Norwegian). Retrieved 2012-09-05. ^ "New homeland CFO faces tough challenge". UPI. Retrieved 2017-04-10. ^ a b Grover, Norquist (August 23, 2009). "First Person Singular: Grover Norquist". Washington Post. Retrieved November 7, 2009. ^ a b c d e f g Robert, Dreyfuss (May 14, 2001). 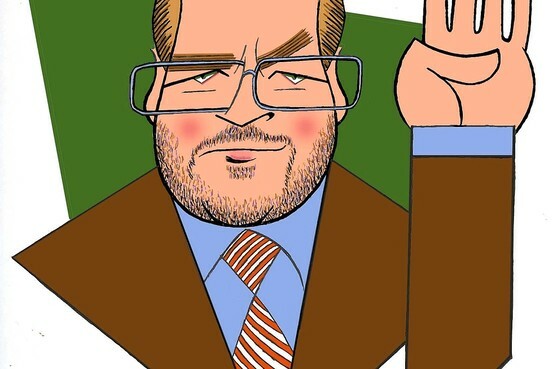 "Grover Norquist: Field Marshal of the Bush Plan". The Nation. Retrieved January 10, 2010. ^ Horwitz, Jeff (May 25, 2005). "My Right-Wing Degree: How I learned to convert liberal campuses into conservative havens at Morton Blackwell's Leadership Institute, alma mater of Karl Rove, Ralph Reed, Jeff Gannon and two Miss Americas". Salon.com. Retrieved November 27, 2011. ^ "The LI Difference". The Leadership Institute. Retrieved October 7, 2010. ^ "Grover Norquist: Republican". NewsMax. Retrieved November 7, 2009. ^ Kleiner, Sam (July 9, 2013). "Meet the Conservatives Who Campaigned for Apartheid South Africa". The Nation. ^ Easton, Nina (2000). Gang of five : leaders at the center of the conservative crusade. New York: Simon & Schuster. ISBN 0684838990. ^ "The New Republic". What I sold at the revolution. June 9, 1997. ^ Grover Norquist (April 2009). "National Tea Party Tax Protests" (online q & a). washingtonpost.com. The Washington Post. Retrieved November 27, 2011. ^ "Cost of Government Day 2008". Center For Fiscal Accountability. Archived from the original on July 10, 2009. Retrieved November 7, 2009. ^ "The Great Tax Debate". NOW With Bill Moyers. Retrieved November 7, 2009. ^ Tom, Bell (May 14, 2001). "Tax-Reform Guru Touts TABOR II". Morning Sentinel. Archived from the original on December 2, 2009. Retrieved November 7, 2009. ^ "Advocates of Florida Spending Transparency Hold Press Conference" (Press release). Reuters. October 28, 2008. Retrieved November 7, 2009. ^ Mora, Edwin (August 26, 2009). "Government Agencies Would Need $16.6 Billion in New Tax Revenue to Buy Carbon Allowances Under Global Warming Legislation". CNS News. Archived from the original on October 3, 2009. Retrieved November 7, 2009. ^ "Taxpayer Group Launches Petition to Ask Sen. Ben Nelson to Keep His Pledge" (Press release). Reuters. October 28, 2009. Retrieved November 7, 2009. ^ See also Peter Beinart. "Going Stronger; What Conservatives Understand about Taxes." The New Republic, May 21, 2001; The Caveman Cometh The Economist, March 31, 2001; John Aloysius Farrell. "Right Where He Belongs." Boston Globe, April 17, 2002; Mara Liasson "Political Activist Grover Norquist" Morning Edition Roll Call, National Public Radio May 25, 2001; Susan Page "Norquist Power High, Profile Low" USA Today June 1, 2001; Robin Toner "Conservatives Savor Their Role as Insiders at the White House" New York Times March 19, 2001; Jill Zuckman "Pipeline Leads to White House" Chicago Tribune June 9, 2003. ^ "Taxpayer Protection Pledge" (PDF). Americans for Tax Reform. 2011. Retrieved December 11, 2011. ^ Berman, Russell (November 13, 2012). "Norquist tax pledge takes election hit". The Hill. Retrieved November 13, 2012. ^ "Gang of Five". Indiana Monthly, version 24, no. 2. Indiana. October 2000. p. 144. Bill Kristol, Ralph E. Reed, Jr., Clint Bolick, and David McIntosh are the other four. ^ Suellentrop, Chris (July 7, 2003). "Grover Norquist, GOP Prophet of Permanence". Slate. Retrieved November 7, 2009. ^ Pillow, Travis (October 25, 2010). "FL: Norquist says tea party should serve as GOP 'exoskeleton' after Nov. 2". The Florida Independent. Retrieved February 16, 2012. ^ "Grover Norquist on Open Borders and Historically Racist Immigration Policy". Reason.com. 2013-07-26. Retrieved 2013-08-01. ^ Schmidt, Susan; Grimaldi, James V. (June 25, 2006). "Nonprofit Groups Funneled Money For Abramoff". The Washington Post. Retrieved November 7, 2009. ^ a b Cassidy, John (July 25, 2001). "Wednesdays With Grover". The New Yorker. Retrieved November 7, 2009. ^ "CSR in the Cross-Hairs" (PDF). Business Ethics. Spring 2005. Retrieved November 7, 2009. ^ Alex Pappas (2013-01-25). "Grover Norquist to push for statehood for Puerto Rico". The Daily Caller. Retrieved 2013-08-01. ^ "NRA Leaders: Grover Norquist". NRA Leaders. Archived from the original on June 23, 2010. Retrieved November 7, 2009. ^ "» Board of Directors & Advisory Council". Goproud.org. June 15, 2010. Archived from the original on August 3, 2011. Retrieved October 7, 2010. ^ "The Volokh Conspiracy » Family Research Council vs. the Second Amendment". Volokh.com. June 23, 2010. Retrieved October 7, 2010. ^ Barr, Stephen (January 20, 2005). "Teaching Uncle Sam to Be a Better Buyer". The Washington Post. Retrieved March 23, 2010. ^ "Membership Roster - Council on Foreign Relations". Cfr.org. Retrieved 2013-08-01. ^ "Maybe They Forgot What "Conservative" Means". 2004. Archived from the original on October 22, 2007. Retrieved September 28, 2004. ^ William Greider "Rolling back the 20th Century", The Nation, May 12, 2003. 276. 18. p.11-19. Paid subscription required. ^ "Leave Us Alone: Getting the Government's Hands Off Our Money, Our Guns, Our Lives". HarperCollins. Retrieved November 7, 2009. ^ Task, Aaron (Mar 16, 2012). "'Debacle': Grover Norquist's Case Against President Obama". Yahoo! Finance. Retrieved April 10, 2012. ^ "Grover Norquist". The American Spectator. Retrieved March 21, 2010. ^ DiMascio, Jen "How Romney, Ryan Differ on Defense Spending." Aviation Week & Space Technology, August 20, 2012. ^ "Norquist: Sequestration ‘Fine Way’ to Stop Overspending." ^ "2004 Annual Report" (PDF). Marriages Recorded in Weston. Retrieved November 7, 2009. ^ Gay, Sheryl (August 31, 2004). "Political Points – Of Marriage Vows and No Tax Pledges". New York Times. Retrieved November 7, 2009. ^ "3rd NAAP Annual Conference". Network of Arab American Professionals. Retrieved November 7, 2009. ^ Sperry, Paul E. (2005). Infiltration: How Muslim Spies and Subversives Have Penetrated Washington. Thomas Nelson Inc. pp. 276–294, esp. 287. ISBN 9781595550033. The relationship gives literal meaning to the notion that Norquist is in bed with Islamists. ^ "Watch out, Angelina! Norquist adopts from abroad". The Hill. Retrieved August 31, 2011. ^ Daniel Stone (October 1, 2009). "Washington's Funniest Celebrity? Hard to Say". Newsweek. ^ The Americans for Tax Reform Foundation also issued a $5,000 grant in 2009 to the Funniest Celebrity Charity Fund. Norquist, Grover; Americans for Tax Reform (May 12, 2010). "Return of Organization Exempt From Income Tax: 2009" (PDF). IRS form 990. GuideStar. p. 27. Retrieved November 25, 2011. ^ "Speaker Bio: Grover Norquist". Leadership Institute. Retrieved October 31, 2009. ^ Roller, Emma (29 July 2014). "Grover Norquist Explains Why He's Going to Burning Man". National Journal. Retrieved 1 August 2014. "Grover Norquist collected news and commentary". The New York Times.